One of the joys of being a researcher is having the chance to work intensively on a common vision, with someone delightful who brings a sharp mind and complementary approach. In that vein, we had a hugely productive 6 week visiting OLnet Project fellowship with Ágnes Sándor, from Xerox. We are both concerned with the development of an infrastructure capable of processing the knowledge level claims that scholars make in their writing. Her work brings a natural language processing dimension to the annotation of significant rhetorical moves in texts, complementing our approach of providing socio-semantic tools for human annotation. This is being applied to the OLnet Project‘s work to build OER Collective Intelligence, specifically, Ágnes worked on the same set of OER project reports that OLnet has been analysing for the Hewlett Foundation, enabling us to compare and contrast what sense humans and machines make of the same reports. By way of context, when we started our work in KMi on this in 1998, which became the EPSRC Scholarly Ontologies Project (2001-04), there was no computational parsing that we knew of capable of detecting scholarly rhetorical moves. A decade on, there is a growing network of researchers focused on this challenge, the machines have got smarter, and here we are integrating machine and human annotation within Cohere as a sensemaking support system. 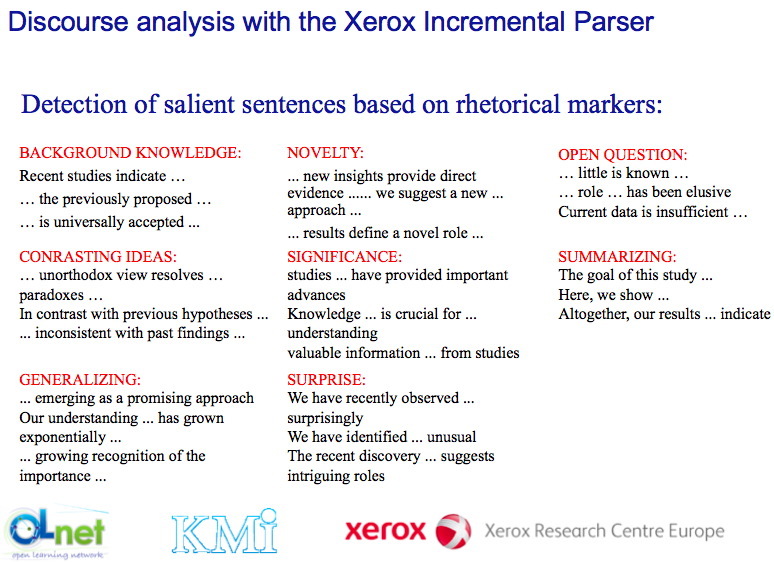 We report on progress made during the collaboration between KMi’s Hypermedia Discourse Group and Ágnes Sándor (Xerox Research Centre Europe, Parsing & Semantics Group). This is the outcome of her 6 week OLnet Project Expert Fellowship at the OU, funded by the Hewlett Foundation, to develop Collective Intelligence for the Open Educational Resources (OER) community. Our research investigates the overlaps and complementarities between the outputs from human analysts making sense of 120 OER project reports, using KMi’s Cohere semantic annotation and knowledge mapping tool, and machine annotation of the corpus by the Xerox Incremental Parser (XIP). XIP’s output is imported into Cohere to explore ways to visualize the combined human+machine output, and we present preliminary results from interviews with some of the analysts to elicit their views on XIP’s annotations. We will present a video on this work as part of the CSCW 2012 video programme. In the video we demonstrate the practical application of research on human and machine annotation of online documents to support reflective reading and collective sensemaking of online documents. We present an innovative research prototype which integrate a discourse analysis software (XIP) with our Cohere Web Annotation and Knowledge-Mapping tool. We visualize an interactive scenario of use of the two integrated technologies in a unique user experience. This dynamic scenario will give an inspiring vision of future CSCW systems, which machine and human intelligence are combined to enhance reasoning power. 1 User Responded in " Cohere plus automated rhetorical annotation "